Release Day for Ripley’s How The Finch Stole Christmas! Grab it Today! – Books, Books and More Books! 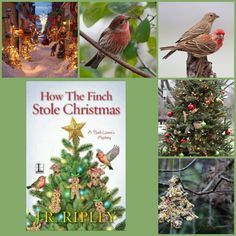 Release Day for Ripley’s How The Finch Stole Christmas! Grab it Today! This is the sixth book in A Bird Lover’s Mystery series featuring Amy Simms and her store Birds and Bees. Selling all things bird and bee related while poking her little nose in the occasional murder. It’s Christmas time in Ruby Lake, North Carolina and Kinley’s Christmas House Village is always abuzz with shoppers. Only this year they seem to be protesting more than shopping. When the village is sold to a Mr. Finch, things turn down right foul. He is not a likable person and the town is up in arms over the changes. But was someone upset enough to murder? It’s not long before Amy is in the thick of things trying to unravel this mystery. And not just for one murder. With every new installment of this series the characters get better. Ripley peels back another layer on characters we thought we knew but oh how we did not! A great stocking stuffer for the bird lover in your family as well as the cozy mystery fan. This sounds so cute and cozy murdery. 😀 I love the title.